Are you having a difficult time finding the best wooden play kitchens? If so, you’ll be glad to hear that we’ve researched what the top options have available so that you don’t have to. All you need to do is have a read below through the top choices that are currently available. We’ve made sure to include all of the main features, pros, cons, the recommended age range, as well as the details that make them each stand out from one another. A buying guide section can also be found at the end to provide you with further information. By the end, you’ll have everything you need to feel great about the Kitchen toy that you choose! 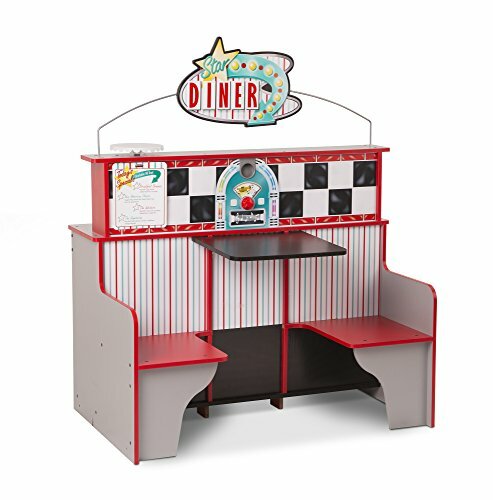 Melissa & Doug’s Star Diner Restaurant Play Set & Kitchen has been made with high grade wooden materials. Therefore, you can be sure that it will last your child for years of play. It includes a seated booth on one side and a kitchen on the other, which encourages children to use the set in small groups. As a result, it can be effective at improving their social skills. There’s also a grill, stove, drink dispenser, fridge, oven, and a milkshake makes. So, kids are provided with plenty to play with and use their imaginative thinking abilities This is awesome for developing their creative thinking skills. We were also impressed with how they’ve designed the set to look like a 50’s diner. It’s a lot of fun for kids to play with and it even comes with a jukebox. We liked how this set enables children to play with a lot of creativity as they have a blast using it while playing with their friends, which is great for their social skills too. 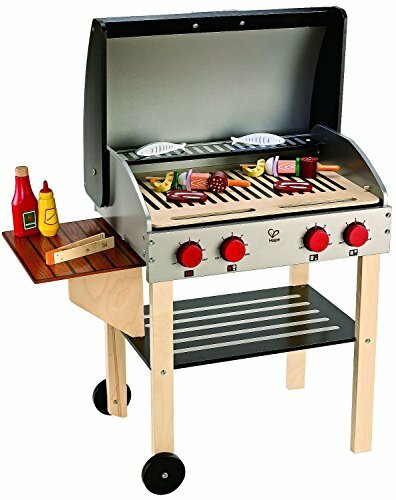 This Gourmet Grill and Shish Kabobo Wooden Play Kitchen by Hape features a BBQ grill that looks incredibly realistic. It has a hood that can be opened and closed, as well as pretend food and grilling utensils. As a result, you can be sure that your child will be able to play with a lot of imagination and develop their creative thinking skills. Kids also have a blast pretending to cook by using this BBQ grill toy with friends. Therefore, it’s effective for improving their social skills. We also liked how they’ve used materials that are free from toxins. So, you can feel confident in knowing that this kitchen play set is safe for your kids to play with. The realistic features available with this set encourage children to play with a lot of creativity and have fun for hours. The KidKraft Large Kitchen Toy has been constructed out of durable wooden materials, which means you can expect it to last your child for a long time. It comes with a microwave, oven fridge, and a sink that can be easily removed. So, there’s a lot going on for children to play with and be entertained for hours. This also means that they’re ability to play and think with more imagination is improved. We also liked how the larger size of this set allows multiple kids to play at a time. It’s an awesome way for them to improve their social skills and ability to work in teams. There are knobs available on the sink and oven which make it feel more realistic for kids to play with. 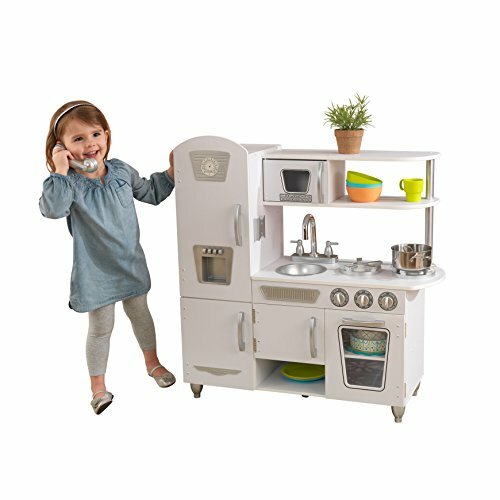 This is an awesome toddler kitchen set if you were looking for something that kids can play with together in larger groups. 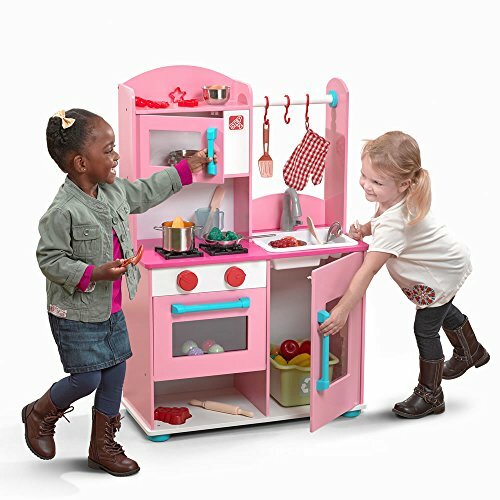 This Midtown Modern Pink Wooden Play Kitchen by Step2 has been made using high-quality wood, which means you can expect your kids to play with it for years to come. It features a microwave, fridge, and a sink. It is especially popular among girls due to it’s pink color. The design of all the components is realistic, such as the clicking knobs available on the oven. As a result, it makes the playing experience more realistic and encourages children to play with a lot more creativity. They also have a lot of fun using this set to play with friends in small groups. As a result, their social skills are given a great opportunity to improve. The pink color is something that attracts girls to enjoy playing with it more. This is an excellent set for helping boys and girls to play with more creativity while also being able to improve their social skills. 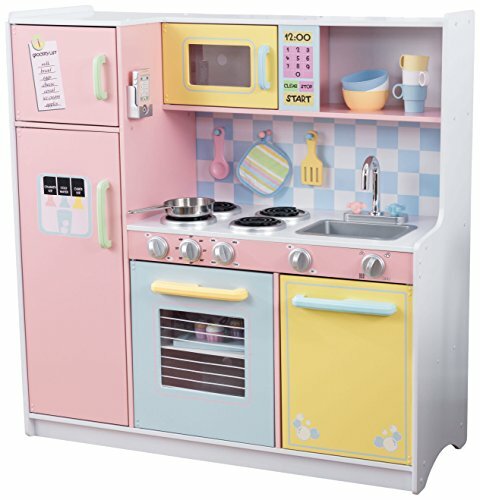 This Retro Kitchen and Refrigerator in Pink by KidKraft comes with a 2-piece modular design which enables kids to set up their kitchen in a variety of different ways. It includes an oven, dishwasher, fridge, and freezer, all of which have doors that can be opened and closed. In addition to this, there are knobs available on the oven which makes it feel more realistic for kids to play with. We found this this to be an important factor in helping kids to play with more imagination and boost their creative thinking skills. 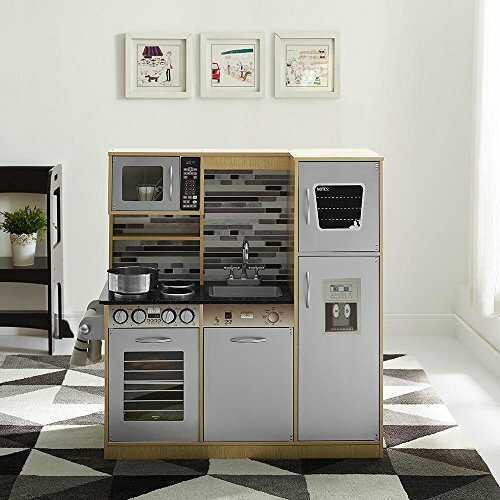 Moreover, this kitchen set is large enough for multiple kids to play at the same time. This can be an effective way to help kids improve their social skills. The construction of this set involves high-quality wooden materials. Therefore, you can feel confident in knowing that it will last your little one for years of play. Kids have been loving this set! 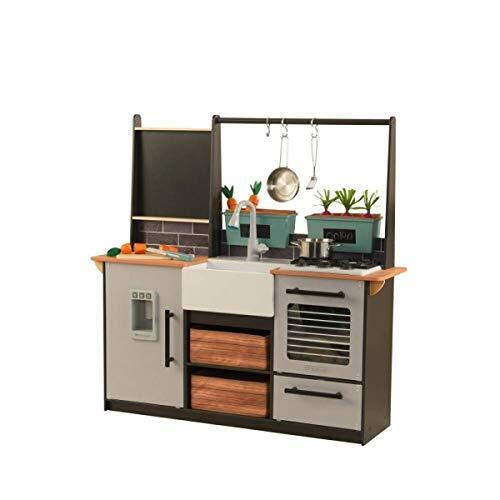 This kitchen set is large enough for kids to play in groups and improve their social skills, while also having a blast and coming up with pretend play scenarios, which is great for their creative thinking skills. 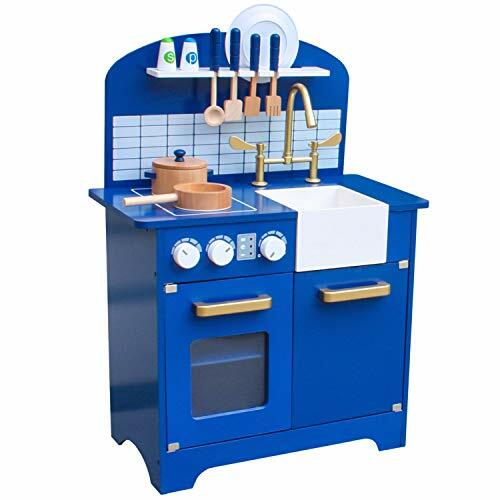 The Giantex Wood Kitchen Play Set for Kids enables them to role play by pretending to be chefs and cooking food. As a result, you can expect your kids to have a blast using this set to play for hours on end. We liked how it’s effective at encouraging children to play with a lot of imagination. This is because it comes with a lot of items for them to play with, including a sink, pots, a stove, doors, knobs, and more. With so many items available to play with, kids have a blast using this set to play with others. Therefore, it can be effective at improving their social skills. Furthermore, parents have been impressed to discover how durable this kitchen is. It has been made using high-quality wooden materials to ensure your kids are able to play with it for years to come. In addition to this, they’ve used some excellent paint which is free from toxins and not prone to chipping away easily. Children have been having a blast using this set to play with their friends and be super imaginative. It’s great for their creative thinking and social skills. 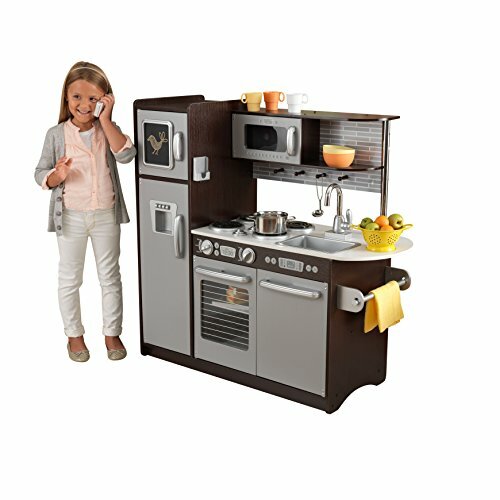 Step2’s Espresso Bar Play Kitchen for kids comes with a stove burner that features light and sound effects. This makes it highly interactive and realistic for kids to play with. Not to mention, their visual and audible learning skills are developed as a result. There’s a large fridge and oven available, which kids have a lot of fun playing with. We liked how all of these different features provide kids with plenty of items to play with and be entertained for hours. It also encourages them to play with more imagination and stimulate their creative thinking skills. Kids are able to play with a total of 21 accessory pieces too. They have a blast using all of these pieces to play creatively with their friends, which is great for improving their social skills. The sound and light effects that are available with this set make it incredibly realistic and exciting for kids to play with. It stimulates their audible and visual learning skills too. This Teamson Kids Bermingham Play Kitchen comes with pretend burners that make sound effects. As a result, kids are able to play with a kitchen set that feels more realistic which enables them to play with more imagination. This is effective at improving their creative thinking kills. There’s a microwave, dishwasher, oven, faucet, shelves, cabinets, and utensils available. So, kids have plenty of items to play with and be entertained for hours of play. With so many items available to play with, children are encouraged to use the set to play with others. Therefore, their social skills are given a great opportunity to develop well. We were also impressed with how there’s a wooden cutting board available. Kids have a blast pretending to cut up the toy food. It’s also fantastic for their motor skills and coordination. Can take a while to assemble! 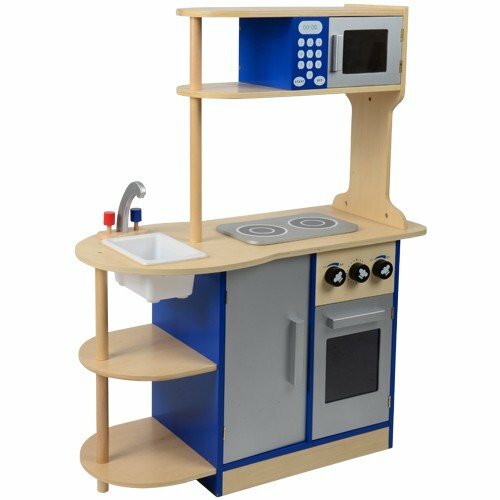 This is an excellent kitchen set that provides kids with the chance to develop their creative thinking and social skills. The Naomi Kids Gourmet Kitchen features a microwave with a keypad, a dishwasher, fridge, chalkboard, and a sink. So, there are plenty of parts for kids to play with and be entertained for a while. We liked how they’ve paid extra attention to detail while making this set as it’s more realistic for kids to play with. They included 4 burners which make clicking noises to sound like real burners. This is another detail that makes it more realistic for kids, while also improving their audible learning skills. Due to these realistic features, children feel more encouraged to use the set to play in more imaginative ways, which is great for their creative thinking. Furthermore, since there are so many parts to play with, kids have a ton of fun using the set to play with others. As a result, their social skills are able to develop well. The number of realistic features that are available with this set make it more exciting for kids to play with. As a result, it inspires them to play with more imagination. 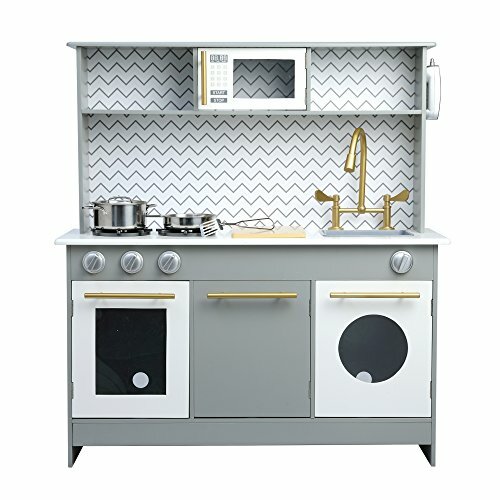 KidKraft’s Vintage Pretend Kitchen features knobs that make clicking sounds, just like real burners do. This is a great way to stimulate your child’s audible learning skills, while also making the playing experience more realistic for them. In addition to the burners, this kitchen st includes a cordless phone, sink, an oven, microwave, and a range of drawers. Therefore, there are a lot of parts for kids to play with and be engaged for hours on end. Furthermore, with so many different things to play with, you can be sure that your child has everything they need to play with a lot of imagination. The larger size of this means that multiple kids are able to play with it at the same time. As a result, you can expect your child’s social skills to improve greatly with this one. 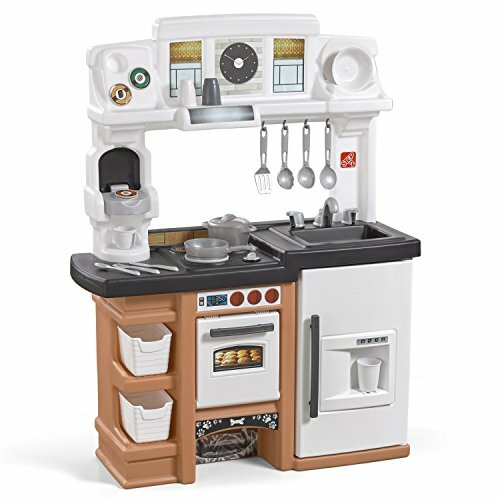 The realistic features and ability to play in larger groups of friends makes this an exciting kitchen set for kids. It improves their social skills and their ability to think with more creativity. 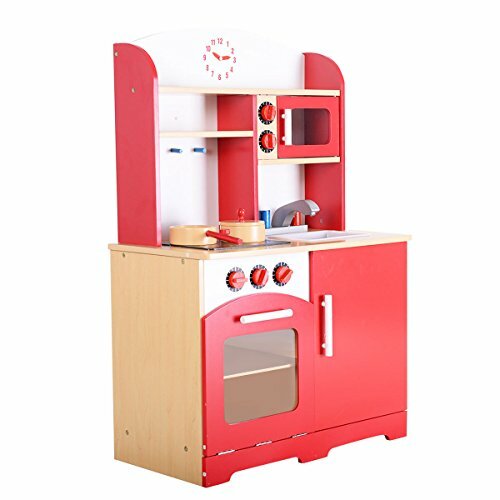 This Teamson Kids Little Chef Wooden Toy Play Kitchen comes with an oven and microwave which can both be opened up. There are also cabinets, a stove, and various accessory items included as well. So, kids are left with a lot of different things to play with and be entertained for a while. As a result, they are also encouraged to use the set and play with more imagination, which is awesome for their creative thinking skills. They would also have a blast using this set to play with others. Therefore, their social skills could be given the chance to develop well. The materials used to construct this set are high-quality wood. So, you can feel confident in knowing that it will last your child for years of play. The paint used it also free from lead to ensure it’s safe for kids. Kids have a lot of fun using this set to play with their friends and be creative, while also improving their social skills. 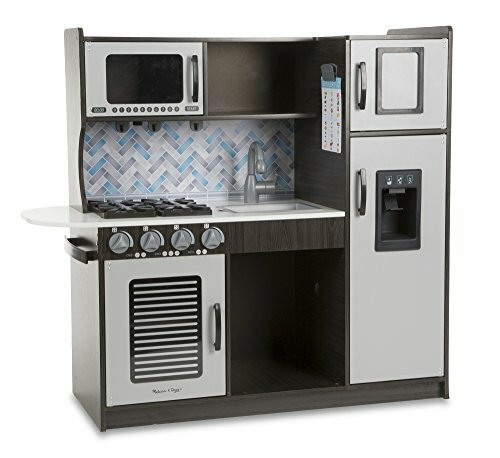 This Uptown Espresso Kitchen by KidKraft comes with an awesome fake ice machine built-in to the fridge. There are knobs on the fridge which move and make noises like real fridges do. This makes the experience more realistic and fun for kids. As a result, you can expect them to play with a lot of imagination and improve their creative thinking skills. In addition to the fridge, there’s a sink, cordless phone, oven, microwave, and various drawers available. So, there are plenty of things for children to play with and be engaged for endless hours. With so many things to play with, children are encouraged to use the set to play with other kids and develop their social skills. We also liked how the chalkboard that’s available is awesome for helping kids to improve their reading and writing abilities. We liked how the chalkboard feature encourages children to develop their reading and writing skills. 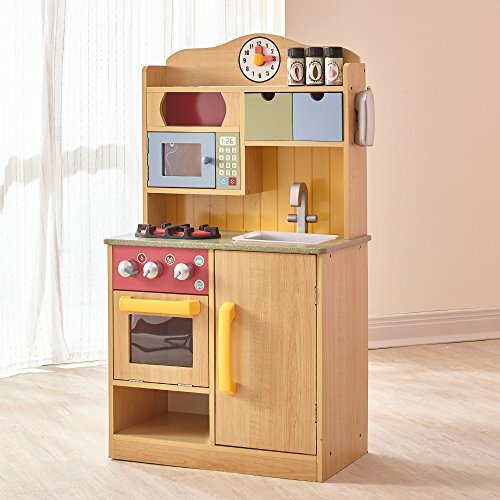 Melissa & Doug’s Wooden Chef’s Pretend Play Toy Kitchen includes a fridge, sink, stove, microwave, oven, and a range of drawers and cupboards. We liked how the fridge comes with a pretend ice dispenser as it’s fun for kids to play with. Therefore, children are left with a lot of different things to play with which keeps them entertained for hours. This is also an effective way to develop your child’s creative thinking skills. This kitchen is large enough for multiple kids to play with it at the same time. Therefore, you can be sure that your child’s social skills are given the opportunity to develop well. Parents have also been liking how the assembly of this set is pretty easy. This instructions are clear and allow you to have it all set up in no time for your kids to start playing with. Kids have a blast using all of the different kitchen features and playing in groups. It’s excellent for improving their social skills and their ability to think creatively. This Farm to Table Play Kitchen comes with a total of 18 pieces. Therefore, you can be sure that your kids will be entertained with this one for hours on end. We were impressed with how it has light and sound effects available. They make the playing experience more realistic for kids while also stimulating their visual and audible learning skills. There’s also a pretend ice maker available that comes with 3 fake ice cubes. This is a feature that kids have a lot of fun with as it enables them to be highly creative while playing. Moreover, with the 18 accessory pieces available, kids have a blast using this set to play with others, which is awesome for their social skills. The assembly of this set is also super easy. This is a result of the EZ Kraft assembly feature. There are easy-to-follow instructions available which let you get this kitchen toy set up without any hassle. The realistic features that are available with this set make it more engaging for kids to play with and improve their creative thinking skills. 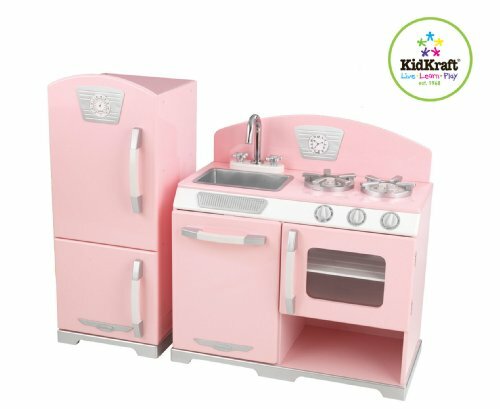 This Pidoko Kids Play Kitchen has been designed with neutral colors which makes it a fantastic choice for both girls and boys to play with. We also liked how it comes with a range of accessories that include a spatula, fork, mixing spoon, pan, pot, plate, as well as salt and pepper shakers. So, kids have plenty of accessories to play with and use along with the kitchen set, which inspires them to use their creative thinking skills. Moreover, with so many pieces available to play with, kids are encouraged to use the set and play with others. As a result, their social skills are able to improve well. The kitchen toy itself includes a sink, stove, counter, and a burner with knobs that can be turned. There’s also plenty of storage space that you can use to tidy things up after your kids are done playing. Kids have a lot of fun using this kitchen toy to play with others and improve their social skills, while also being able to think with more creativity. This Constructive Playthings Wooden Deluxe Kitchen Play Set features knobs that can turn and make sound effects. As a result, the set feels more realistic to play with and develops your child’s creative skills. It’s also beneficial for their audible learning skills. In addition to the knobs, there’s an oven, microwave, a fridge, and movable faucet parts. So, there’s plenty of items for kids to play with and be entertained for hours of play. With so many items available to play with, kids are encouraged to involve others which is awesome for their social skills. There’s a clock available that comes with hands that can be moved. Kids love using this to set meal times, which is an effective way to teach kids how to tell the time. We also liked how they’ve used high-quality wooden materials to construct this set. They are incredibly durable and allow kids to play with their kitchen for years to come. There’s also plenty of storage space available to keep all of the accessory items tidied away when your kids have finished playing. The realistic features available with this set are excellent for inspiring kids to play more imaginatively and develop their creative thinking skills. Now that you have a better understanding of what the top kids kitchen sets have to offer, you can start to think about the ones from this review that you think your children would enjoy playing with the most. However, if you were still not feeling 100% confident on the type of set that you think your child would like the most, this buying guide section is for you. We’ve included additional information that will help you feel great about the final decision that you go with. After reading through this review, you will have seen that there are quite a few different accessories and accessory sets available. Some of the kitchen sets may not come with as many items as you were hoping – in which case, you may want to consider some of the accessories mentioned in this section. Providing your kids with additional accessory items is great for encouraging them to play with even more creativity. One of the most popular accessory kitchen toy items include play food sets. We found that some of these play food sets include more details than others. Therefore, we recommend those sets for older kids as it makes it more realistic to play with. However, the more simple looking play food sets may be great for younger kids. These accessory sets also tend to come with a Velcro feature that allows the food to be split in half. This enables kids to pretend to cut the food in half, which is a lot of fun and helps to develop their motor skills and coordination. Utensil sets are among the popular accessory items as children have a blast including them in their pretend play scenarios. They can use the various utensils to pretend to make and serve the food, which is awesome for encouraging them to play with more creativity. You can often find stove accessory items if the set that you chose didn’t come with one. They’re excellent for expanding your child’s kitchen set and adding to their collection over time. This is another one of the accessory items that makes it more realistic for kids to play with. Many toy kitchens already come with pans, but there are some that don’t. There are plenty of pretend play pans available online that have been designed to be lightweight. This ensures that kids are able to handle them and play with ease. Pretend play dishes are a great accessory item that let children serve up the food that they’ve just had so much fun preparing. Similarly to the pans, they tend to be pretty lightweight to make sure that kids are able to use them without any hassle. Appliances, such as pretend microwaves, toasters, and kettles are fantastic additional items. Some of the sets mentioned in this review come with these appliances already. For the sets that don’t come with these appliances, you can easily purchase them and add to your child’s toy cooking set. They’re among those accessory items that make it more realistic for kids to play with. It also gives them more to do and encourages them to be creative. There are a number of fantastic brands in this review that make pretend kitchen sets. If you were interested to learn more about these brands, you’ll want to take a quick look below. Little Tikes produce an incredibly wide range of different toys for children. They were founded in 1970 and have since grown to distribute toys all across the world. We liked how their toys encourage children to have fun and be imaginative. They also ensure that children are able to develop certain attributes, such as their social skills and teamwork abilities. KidKraft is a company that started out around 50 years ago, and they’ve always had the goal of making toys that inspire kids to be creative. Their toys encourage kids to explore more and have a blast at the same time. Melissa & Doug is one of the most popular brands when it comes to toys for kids. This is because they make their toys with the purpose of helping kids to play with a lot of imagination and boost their creative thinking skills. Their toys also help with crucial developmental factors, such as motor skills and hand-eye coordination. The Melissa & Doug sets mentioned in this review have been designed with a lot of color, which make them a lot more exciting for kids to play with. Hape is among one of the largest companies in the world that produces toys made out of wood. They focus on using high-quality materials that are also renewable. We also like how they create their toys with the intention of inspiring kids to explore more and play with a ton of imagination. Step2 is an awesome brand that is known for making toy sets that provide children with an outlet to be incredibly imaginative with. As a result, their toys improve children’s ability to think more creatively. So, that wraps up our review on the best kids toy kitchens. Be sure to read over the main features, pros, cons, age recommendation, and what makes each toy set stand out. That’s what will provide you with the most well-rounded view on each of the sets. You can also use the buying guide section to gain more value and a better understanding of how to go about picking the best wooden kitchen toy for your child. Picking the right set from this review would be effective at keeping your child engaged for years to come. All of the information that you need to go ahead and find that perfect set for your child can be found, right here!